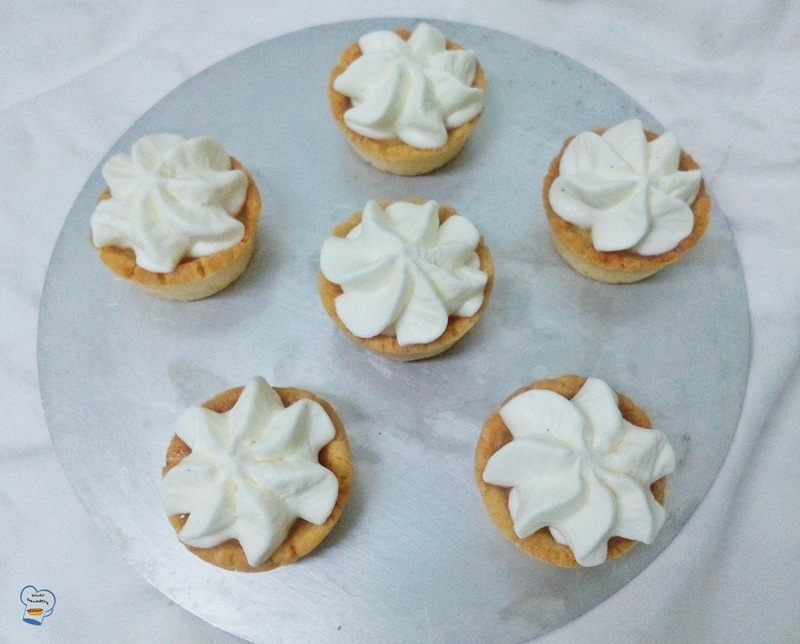 The crispy tart shell was made using the recipe from Le Cordon Bleu Dessert Cookbook. I used icing sugar in place of superfine sugar. I made the tart shell a day earlier and kept it in the freezer overnight. I used a non-stick 24-hole muffin pan for this recipe. You have to do your math if you are making it for a large group. I doubled the recipe. The portion yielded seventy mini tarts and two 9-inch tarts. Note: A well-chilled dough will result to a crispy tart crust. For the filling, I decided to go with Gregg's tangy lemon tart recipe. It has the least ingredients among all the recipes I found online that made into my top five. I also liked that it can be prepared in no time. juice of 2-3 lemon (about 100 ml). If you like a rich tangy taste, you can add more lemon juice. I forgot how much more I added. What you can do is to taste your mixture and adjust the flavor to your liking. Sift the flour and icing sugar into a bowl. Rub in the butter. Lightly whisk the egg yolks and vanilla. Pour the egg yolk mixture into the dry ingredients and mix to form a dough. Press together lightly. The cook book says to chill for 30 minutes. I skipped that method. While the dough is still soft, I divided it in equal parts. I rolled dough into small balls and put it in each muffin hole. With my fingers, I made a deep well in the center of dough. Prick the base all over with a fork. Cover with clingfilm. Freeze. Bake at 160 C for 5 minutes. Remove from pan and cool completely. Simply beat all the ingredients together except for the lemon peel. Sieve the mixture to get rid of lumps. Add the peel last. Pour the filling into the cooled pastry shells. Bake for another 10-12 minutes or until just set. Cool completely before piping the whipped cream on top. Place whipping cream into the mixing bowl. Scrape seeds of vanilla bean and add into the cream. 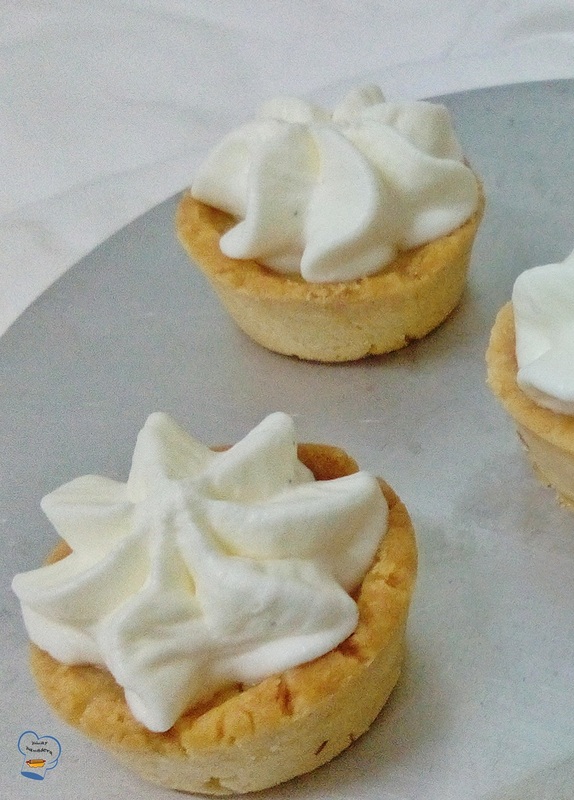 Beat whipping cream on high until soft peaks form. Gradually add the icing sugar. Continue beating until stiff. Pipe on tart using 1M open star tip. You can garnish it with a thin slice of lemon or mint leaf.